Ares, the Greek God of War, mounted on a horse rides into battle. He is the patron of all Warriors and reminds us to fight for what we believe in. In mythology, Ares was short tempered and passionate often fighting for love and glory. Soldiers going into battle in Ancient Greece or Rome would make sacrifices to him and pray to Ares for swift victory. It was said he favored all those that showed courage in the face of any fear or battle. Ares (or Mars to the Romans), was the God of Warrior and patron of all Warriors. Son of Zeus, he was one of the strongest of the Gods. Designed by artist Derek Frost, this Ares statue depicts the God of War mounted on a war horse leading his men into battle. 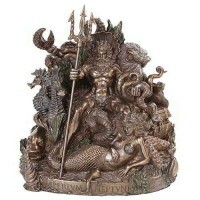 Made of cold cast bronze infused resin, this God statue has exceptional detail and a bronze finish. He measures 8 1/2 inches high holding a sword ready for battle. Item Number: PT-8922 | Approximate Size (Inches): 10.50 wide x 4.75 deep x 8.50 high | Approximate Shipping Weight: 5.00 lbs.